Knowledge : Nagoya-Obi - KIDORAKU Japan - What a Kimonoful World! Nagoya-Obi is a casual Obi. It's worn by women with many kind of Kimono. 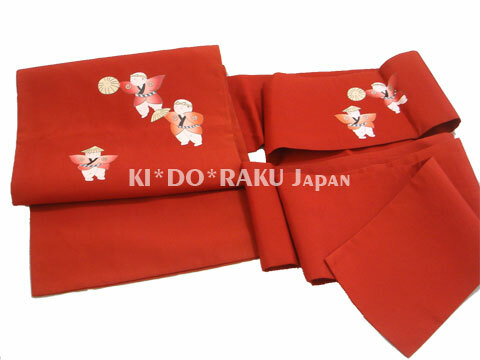 If it has formal design (golden or glittering), it's worn with a semi-formal kimono. It's around 30cm in width, and 340-360cm in length. And, a half length of it is often folded over lengthwise and sewed. Nagoya-Obi was born in Nagoya, the Aichi prefecture capital. It was invented in same movement as Fukuro-Obi. a originator of a girl's high school "Nagoya Jyo-gakkou". She was the first female member of the House of Representatives of Japan.